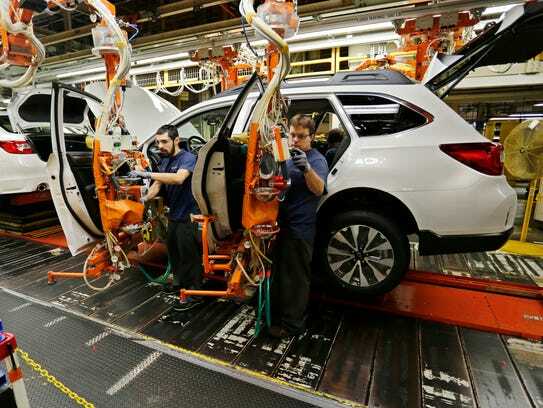 Subaru on Monday announced an expansion to the Lafayette plant that will create 1,200 new jobs, just 1 1/2 years after initiating a $400 million expansion that still is underway. Tom Easterday, Subaru of Indiana Automotive Inc. executive vice president, on Monday announced that the company will invest $140 million to expand the plant and boost production of the Subaru Outback, Legacy and Impreza models to about 390,000 vehicles a year — an increase of 100,000 vehicles per year. The announcement on Monday came days after Gov. Mike Pence and Indiana business representatives returned from a trade mission to Japan. Talks among the company, state and local government officials, and economic development representatives had been in the works for months, Pence said. The trade mission, Pence said, allowed him an opportunity to give a face-to-face answer to one of Fuji Heavy Industries’ key concerns: whether there is a qualified workforce available in and around Lafayette. “As I talk about our new demand-based workforce development focus, and as I brag about our community college and higher education systems, you can tell all of that resonates with leaders that are looking at our state,” he said.